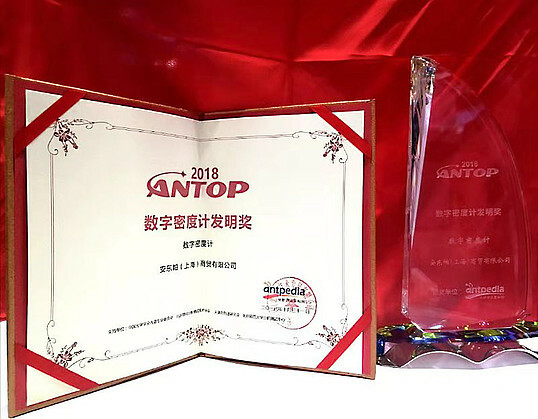 The ”Density Meter Invention Award" is based on a vote among subscribers of the leading Chinese instrument media "Antopedia" and a jury of industry experts. Anton Paar exhibited its full line of new density meters based on the recently developed "Pulsed Excitation Method" on Analytica China 2018. With this new patented technology, unmatched levels of accuracy and repeatability in density measurement are available to the users worldwide. Recently, Anton Paar has virtually squared the circle and renewed the measuring principle based on an oscillating U-tube, which was a long time thought to be fine-tuned. „We identified the limitations of the old oscillating U-tube method and ultimately replaced them with new technology,“ explains Siegfried Hold, product manager for Anton Paar‘s high-end density meters. Thanks to elaborate simulations and several prototypes, the patented "Pulsed Excitation Technology" is available. The oscillator can now vibrate freely before it is excited again which leads to three times more information and enables a precision of up to incredible seven digits. Meanwhile, this technology is incorporated in all high-performance density meters made by Anton Paar and offering more advantages like an improved viscosity correction, an optimized detection of bubbles and particles, and an integrated viscosity measurement.